Jessie and her grandmother live in a poor village in the valleys of eastern Europe. When, to everyone's surprise, young Jessie is chosen by the rabbi to travel to America, and must leave her beloved grandmother behind, they both feel their hearts will break. 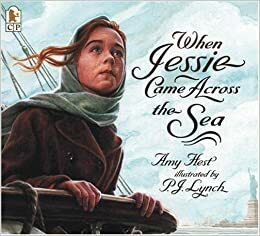 I am just starting my own discovery of who my ancestors were and this story by author Amy Hest caught my attention one day while I was browsing the shelves of my favorite book store. Illustrator P.J. Lynch has portrayed so well on the book's cover the emotional turmoil Jessie must be feeling as she has her first glimpse of Lady Liberty and the shores of her new home. Readers get to know Jessie and her grandmother as they struggle to keep body and soul together in the old country while working their land during hard times. Grandmother insists Jessie goes to the rabbi for daily lessons, even while Jessie scoffs at the idea that learning to read and write and sew fine lace will ever help her later in life. Beautiful artwork helps tell the story of heartbreak when the two discover Jessie will soon travel alone for a new life across the sea. We are drawn into Jessie's temporary world of life aboard ship and Jessie learns to put aside her sadness at leaving her grandmother behind as she reaches out to help others on board. The final part of this story comes when Jessie reaches America and is met by her cousin Kay who lives in the bustling, turn of the century, New York City. There is much to do and learn in her new life and Jessie discovers money can be made from her newly learned sewing skills. Jessie is content in her new home, but only one thing will make her truly happy and she has a plan to make that wish come true! A great addition to any home library! Like-O-Meter Rating: 5 out of 5...grab it! 4 out of 5...think about it. 3 out of 5...take or leave it. 2 out of 5...maybe not for you. 1 out of 5...forget about it! It sounds like an informative read about a young girls travels to a new country home. It would be interesting to learn how she helped others aboard ship to fill her lonely hours. Hi Erik! It IS and the artwork is very lovely as well!